Opposite you, the Hermitage hill represents more than 2000 years of history. The Cave de Tain was founded by Louis Gambert de Loche in 1933. 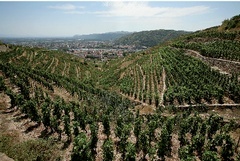 Four years later, these slopes gained Appellation d'Origine Controlée status and then, gradually, international fame. Thus, for nearly 80 years, the history of the Cave de Tain and the Hermitage appellation have been closely related. The Cave plays a major role in the appellation (one bottle out of four of Hermitage comes from the Cave), thanks to its growers and its own wine estate in the appellation.